Any business that registers students for camps, classes, or other events can benefit from pickAtime's online event registration. Available 24/7 on desktop, tablet, and mobile. Include your school or organization name and logo. Customization of front-end messaging. Personalized and customized registration forms. Accept credit card payments online. Powerful Administrative tool to setup event registration. Numerous event customization options available. Ability to set when event registration opens and closes. Single or Multiple event booking. Several options for display of classes/camps. 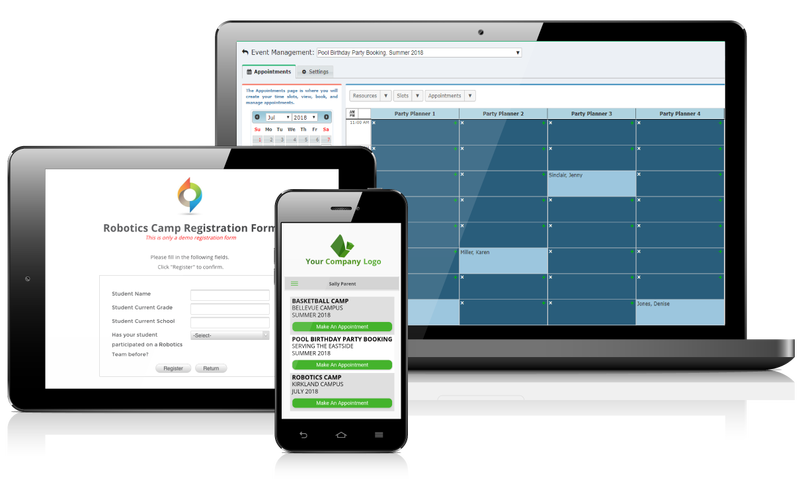 Booking can be automatically synced to most major desktop, mobile and cloud based calendaring solutions, including Outlook, Google, and iCal. Multiple reporting options, providing details on registration activity. Reports can be exported, printed, or emaild. Scheduled report delivery options. Manage customer information. View full customer history and upcoming class/event registrations. Request and report on any additional information prompted of customer when registering and/or booking. Collect waivers and documents. Multiple user access levels available. Limited access can be set for specific email addresses. Report viewing access only is available. Appointment making access only is available. Full administrative power is available. PickAtime is hosted on dedicated servers in a locked and secure data center. Secure Socket Layer (SSL) technology is used to encrypt the data for transmission. All information collected by pickAtime is made available only to the client that the customer is making an appointment with.